Hi Fellow Travellers, it's Julie from Juliz Design Post here. Lovely to have you joining me on our monthly journey. Using all of the above elements this is how my project came together. Starting with the Umbrella Man I placed my Metal Foil Tape on to Cereal Box card, die cut him out and ran through my Embossing Folder. Using my applicator tool I added my Alcohol Ink followed by some Distress Paint, letting it dry slightly before polishing with a rag to buff it up. Next I glued some Correspondence Paper to cardboard and die cut out my Postage Stamp die, adding some Stamping for interest, a couple of Screw Brads and Industrious Stickers. You will also notice I added a little Distress Paint around the edges, this draws your eyes into the middle of my Frame. In this photo you will see my complimentary colours of Alcohol Ink used to give my Ombré effect. 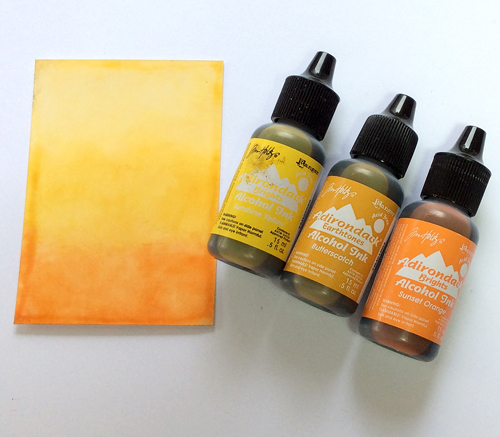 I placed each colour separately onto my Alcohol Ink Applicator Tool applying it on to my Speciality Stamping Paper. Once I was happy with the shades I then blended with Alcohol Blending Solution. 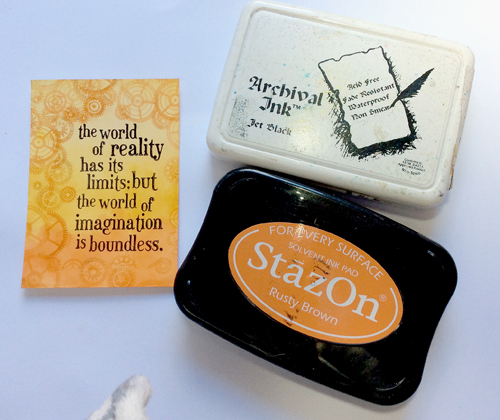 Next stage was to stamp my Sentiment and layer up my Cogs stamping with first and second generation ink. Another photo of my finished project. I hope you have enjoyed my post and feel inspired to try out these techniques. Our Current Challenge for this month is Things with Wings and next Monday you will see another Creative Guide using the same products and techniques at Terminal 2. Thanks for stopping by and for all the wonderful comments you leave for us, we all appreciate them so much. 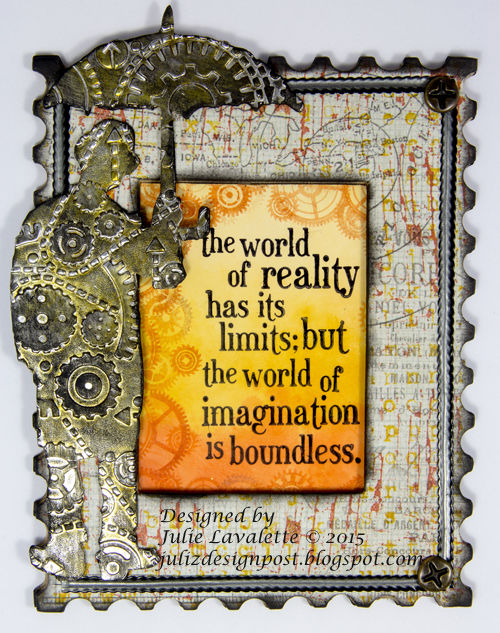 Brilliant, Julie - I love the metallic texture of Umbrella Man and your postage frame is just fantastic! A fabulous project using one of my fave Tim dies Julie Love him in his textured metal and the feel of a reflected glow you have given him with the alcohol ink . 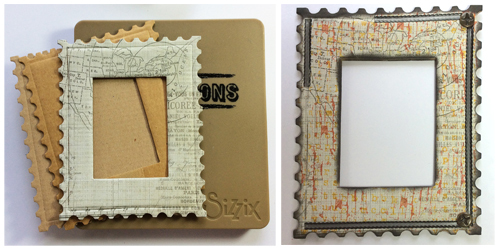 The postage stamp frame is great and love the stamping detail on the correspondence papers . I LOVE IT! The metal man looks fab and love the ombre shades you have chosen! So vibrant against the metal. Julie, I love the way you combined the required elements and worked that ombre technique! All the layers are beautifully combined! Hugs! Brilliant Julie, what a clever way to use Umbrella man! Love how you put this together, what a clever way to use all the ingrediets in your travel bag! Oh - just WONDERFUL Julie... Wow.... love the colors and all the ways you combined your ingredients to PERFECTION. 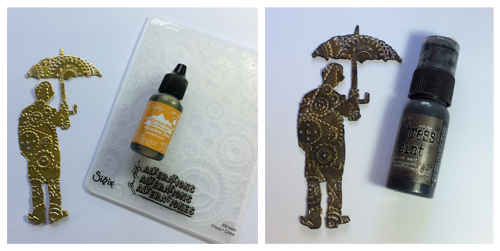 j.
Fabulous Julie, love your colour palette and the wonderful texture on the umbrella man die!